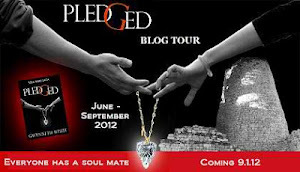 Prejudice Meets Pride by Rachael Anderson Book Blast!!! I really enjoyed Lydia's story and as a character, she is the kind of friend everyone would want to have! She is sweet, kind, and down-to-earth. Her story was endearing how she went away for the summer for an adventure and ended up reading all summer! I could totally relate to her! Wanting to be adventurous and actually doing it are two completely different things! So she chose the safe side and read; reading usually never lets you down! Anyway, she runs into Blake at the airport for her flight home. Lydia's adventure begins there! I enjoyed the development of their relationship and their adventure together! If you love sweet romance with great writing, you will love Lost and Found! I LOVED this book! Anyone who is Christian will find it uplifting, helpful and full of great advice for living their lives like Christ every day of the week. I found reading this book to be addicting! I seriously could not get enough and found myself pulling out my highlighter (which I NEVER do) and highlighting things that I wanted to remember. The pages flew by so quickly...too quickly for me. I found myself grateful I highlighted because once I was finished I immediately turned back to my highlights and shared them with my husband and family members. Wilcox has an easy to read, straight forward manner of writing. His personal stories along with quotes by other well known people coupled with his own amazing words makes for a book that I could not get enough of! Anyone who wants to pattern their life after Christ will benefit from this book! It is full of positive and uplifting ways to help you live your life after the example of the Savior. One of my favorite parts was the story concerning C.S. Lewis. My favorite quote from the book I must share! " God did not remove the Red Sea, He opened it: He will help us find a way through our problems as well. The light does always reveal distant landscapes; sometimes it gives us just enough vision to get us through one day at a time." These are words to live by! Five brilliant stars and I would give it more if it would let me! 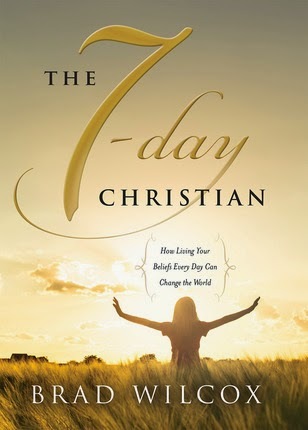 I recommend this book to any Christian striving to be a better person! BRAD WILCOX has lived in Ethiopia, Chile, and New Zealand; he and his family now make their home amid the Rocky Mountains. Brad taught sixth grade before obtaining his PhD in education from the University of Wyoming. His contributions as an author and teacher have been honored by the Geraldine R. Dodge Foundation, and his work has appeared in Guideposts magazine andReader’s Digest. He once served as a member of the National Executive Board of the Boy Scouts of America and has addressed thousands of youth and adults across the United State, Europe, Australia, and Japan. He and his wife, Debi, are the parents of four children. 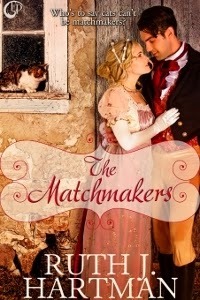 The Matchmakers is a cute regency novella about one eccentric Aunt Esther, her nephew Baldwin, Jessie (I like to think of her as the cat lady) and numerous cats! 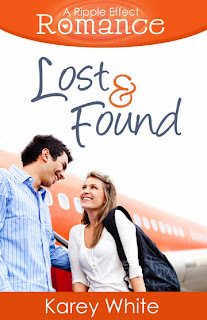 The story is laugh out loud funny and has some of the sweetest moments as well! Hartman develops not only the human characters but the cat characters also! Hartman's writing made for real life scenes in my mind and I could envision the barn, the cats, the wind blowing through Jessie's hair! If you want a good laugh and some romance too, then you will love The Matchmakers! In Collide, the story begins unfolding immediately! And I mean immediately! You meet the main character and then BAM! She runs into this older gentleman and something happens to her! I was surprised at how quickly the action began, only because I knew so little about the main character and who she was, what she was like. Aside from that, the story is very intriguing. Melina is one of a few people who can absorb the powers of angels. None have ever survived it, so she has to figure out how to gain control of them with the help of her guiding angel Walter. This story is different and definitely interesting. I read it pretty quickly and it kept my attention. There were a few inconsistencies that were a little bit bothersome to me and overall I personally felt like Melina's character was underdeveloped. However the book kept my attention and the story-line was unique! 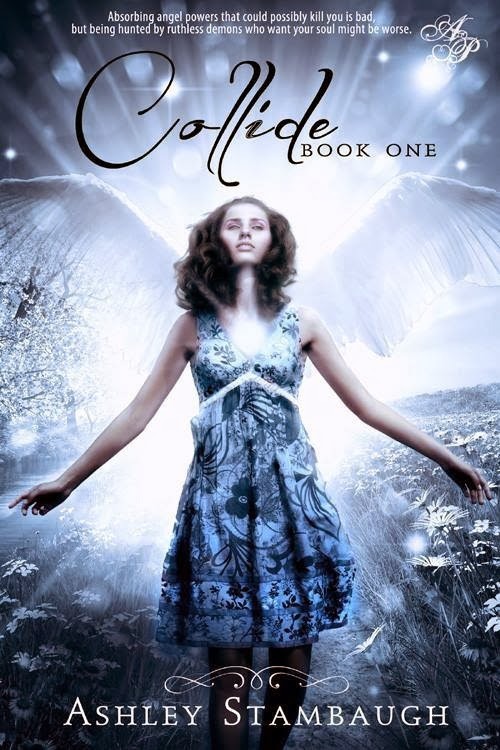 You can pick up your own copy of Collide via Amazon. 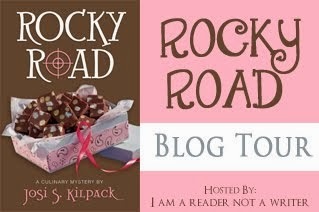 I love the Culinary Mystery series by Josi Kilpack! If you haven't read this series and you enjoy laughter and a great mystery, then go buy it! You will LOVE it! Fortune Cookie is just what I expected and even more from Kilpack. In typical Sadie style, another mystery falls into her lap and she just can't stay out of it! Even when she tries she can't help herself! 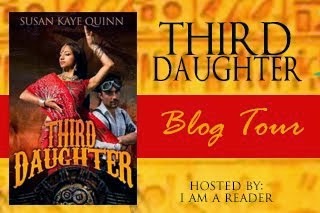 And in Fortune Cookie the mystery happens to revolve around her sister so in a way she feels obligated! I love how Kilpack incorporated the fortune cookies into Sadie's mystery solving, it was a great element to the book! A little detour in Sadie and Pete's relationship added another layer that makes Kilpack's story telling realistic and dynamic. 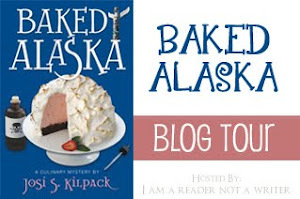 Added to that are all of the wonderful foods and desserts described by Sadie that make Kilpack's Culinary Mystery series spectacular! I loved reading Fortune Cookie! Sadie is a favorite character of mine and I will be sad when the series ends, I feel like I will be losing a friend! 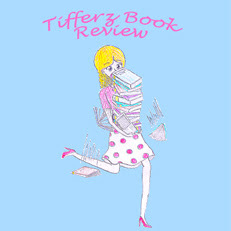 Five stars for Fortune Cookie and please read this series if you haven't already, it is so fun! I devoured this novella in what seemed like no time at all! I fell in love with Jessamine and immediately felt such strong emotions for her situation right from the start! Rogers completely pulls the reader into Jessamine's world, which is full of problems. I was reminded of the fairy tale Cinderella, but when all was said and done it really was nothing like Cinderella at all! I felt so many emotions throughout this book and I felt them so strongly. I wanted Jessamine to come out on top of all of her problems. I wanted her to rise above all of the terrible things her family had done to her. I couldn't believe so many people were out to make her life so miserable! Rogers' drew me in from the start and had me flying through the pages to the ending! If you want an emotional read full of ups, downs and all around emotions, this book is for you! An Edwardian novella full of romance and mystery, Jessamine's Folly is an all around winner! 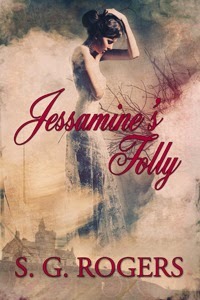 You can pick up your own copy of Jessamine's Folly via Amazon. 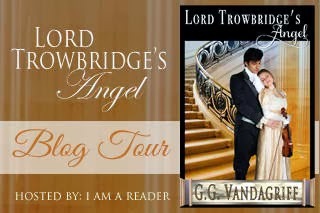 This is the third novella in a series of six. This time we get to read about Jace's story from Silver Linings. Jace is a mystery and so is Cambri. Why did they break up all of those years ago? Why did she never get back in touch with Jace? Now he seems to run into her everywhere and the pain of the past keeps getting thrust in his face. The emotional turmoil of her past and the relationship with Cambri's father all seems to be more than Cambri can handle. 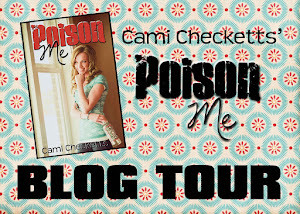 Will Cambri and Jace ever talk and work things out? Is there a happy ending for either of them? 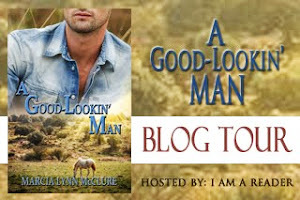 I loved even the minor characters in this book like Grandpa Cal and Cambri's Dad. The small town setting and and the sense of family and friends will leave you with a satisfied feeling! 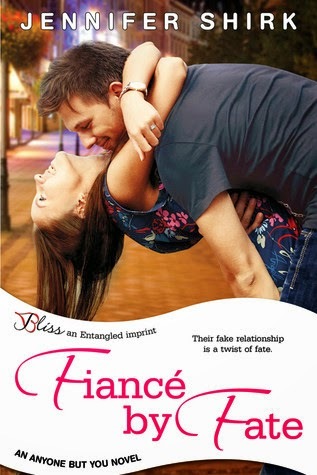 Fiance by Fate by Jennifer Shirk Book Release Day! Brooklyn Prescott (if that's even her real name) is the new girl at The Rosewood Academy for Academic Excellence, now that she's moved back to the States after two years living in London. Rosewood, a boarding school for children of the rich and famous and known for its celebutantes, is missing just one element important to any junior's education: boys. But luckily for Brooklyn, and the rest of the Rosewood girls, there's a boys' boarding school, The Westwood Academy, just a few miles away. On her very first day, Brooklyn meets Will, a gorgeous and flirty boy on campus to help with move in. But is he who she thinks he is? And what about Brady, the cute stable boy? Or Jared, the former child actor with his grown-up good looks who can always make her laugh? As Brooklyn settles in at Rosewood, she's faced with new friends, new challenges and new opportunities to make herself into the girl she always wanted to be. Whoever that might be. Taking The Reins is the first installment of The Rosewoods, an exciting new Young Adult series for readers who love fun, flirty love stories. I really liked Brooklyn, teenage girl who wants to reinvent herself at her new all-girls boarding school She is unsure of herself (typical teenager) but really sweet and kind. I liked that about her, a lot. I was surprised at how kind the girls at the school were to her, especially since she was new. I really expected them to be mean and catty, especially since it was a school for rich kids. All of these things were pleasant surprises to this YA novel. Of course, no YA book can really be about just girls, so cue the all boys rich kids boarding school just a few miles away! The flirting, the friends, the dance, all of those things rounded out the story. The continual references to ''hooking up" were in my opinion, referenced too many times. It just made it seem like that was all the girls cared about. However, my favorite part of the book was the horses! I loved the stables, the dressage coach, the sparks that fly between Brooklyn and Brady! I felt like the story flew by and then BAM! It ended without expectation and I wanted the rest of the story! I guess I will have to wait and read the sequel; I truly wish it would have been one book! 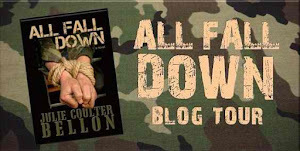 Overall this is a quick, easy and enjoyable read! 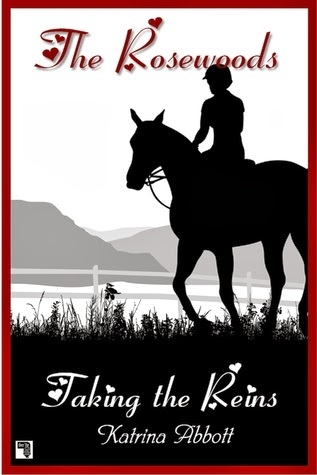 You can pick up your own copy of Taking the Reins via Amazon. First I have to start off by saying that if I was judging this book based on cover alone, it would be a winner! The story is as much of a winner as wonderful as the cover! The Duke of Clairmont is brooding, strong willed, and devastatingly handsome! Miss Standhope finds herself in a situation she never foresaw, having to become a governess to make ends meet. Neither imagined that sparks would fly and they would fall in love with each other! The Duke sees Carlotta as forbidden and she sees him the same way! The anticipation, the sparks and swoon worthy kisses, this entire book had me flying through the pages to figure out the end result! 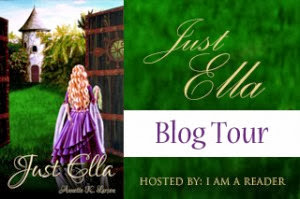 A wonderful regency romance, What the Duke Wants is a perfect fit for any historical romance fan! You can pick up your own copy of What the Duke Wants via Amazon. About the Author: John Bytheway served a mission to the Philippines and later graduated from Brigham Young University. A favorite speaker and teacher, John holds a master’s degree in religious education and is a part-time instructor at BYU. John is the author of many bestselling books and audio products. He and his wife, Kimberly, have six children. 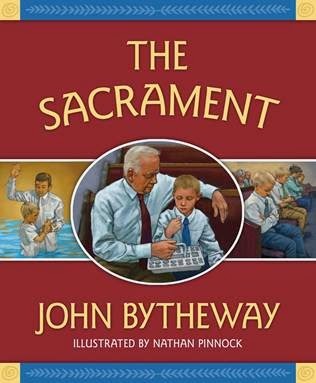 The Sacrament by John Bytheway is the perfect book to explain not only the importance of the sacrament but the importance of reverence and worship during the sacrament. The story is told in first person poetry of a young boy who goes with his family to visit his grandfather. 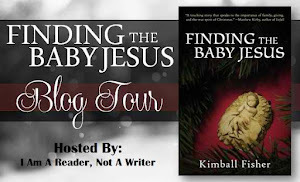 It is easy to follow and the words that his grandfather told him about the Savior and the sacrament make the reader take a step back and evaluate their own worship during this sacred ordinance whether young or old. We used this book as a family home evening story and it was a huge success! We discussed the importance of reverence and the renewal of baptismal covenants made for those who have been baptized. A huge bonus is the definition of sacramental terms at the end of the book that are a great reference for explaining each part of the sacrament. A great book for all ages of children to read and look at the pictures and as an adult I enjoyed it too! You can pick up your own copy of The Sacrament via Deseret Book. This is one awesome book! It made me fall in love with the small town of Seashell Beach and brought back sweet memories of time with my own family on the coast of California. Although this book is written in three parts by three different authors it felt completely cohesive to me. 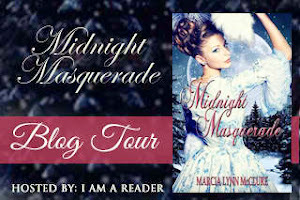 I enjoyed each different part of the story and I enjoyed how the fortunes from The Fortune Cafe played into each romance! Each different section (there are three) have their own unique romance stories and all include the scenic town of Seashell Beach. I have to say that I chose this book to read because I am a huge fan of Heather B. Moore! I have now become fans of Julie Wright and Melanie Jacobson as well through their amazing stories in The Fortune Cafe! The yummy food that was a part of each story was so well described I was hungry just reading it! There is laughter, frustration, romance, sadness, love, anger...basically every emotion you will experience throughout this book! I highly recommend this book! Find your favorite reading spot and get comfortable because you won't put this book down until you are finished! 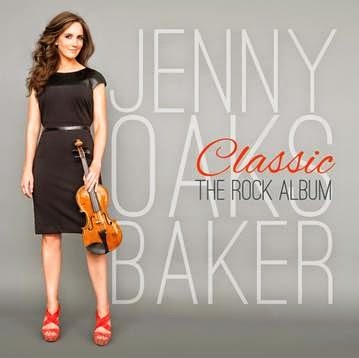 Grammy-nominated concert violinist Jenny Oaks Baker takes her style to an all-new level with her new release, Classic: The Rock Album. Featuring classic rock favorites like Stairway to Heaven (Led Zeppelin), Sweet Child of Mine (Guns and Roses) and Hey Jude (The Beatles), you won’t believe your ears as one of the country’s most accomplished and acclaimed violinists combines her insane talent with the hear-pumping tunes that have defined a genre for generations. I am a new listener to Jenny Oaks Baker and I am completely impressed with her talent! She has taken classic rock songs to a new level as she displays her amazing talent on the violin! You will be blown away by her versions of classic rock songs! Who knew that classic rock could sound so great on the violin? 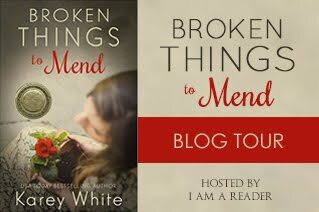 I have always loved the violin and now I cannot wait to hear more from Jenny Oaks Baker! If you are a classic rock fan, a violin fan, hey if you are just a fan of good music.....then you will love this album by Jennie Oaks Baker! AMAZING! Seriously, everyone needs to listen to this one! It will get your toes tapping and you will be humming or singing along with her beautiful playing! ABOUT THE CHOIR: The 360 members of this remarkable choir represent men and women from many different backgrounds and professions and range in age from 25 to 60. They reflect a medley of unique lives and experiences and are brought together by their love for singing and their faith. Their incomparable voices are the common chord that unites to form the choral group known all over the world as the Mormon Tabernacle Choir. 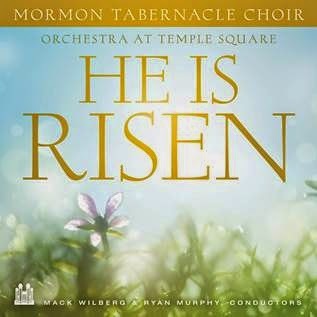 There are six beautiful songs on the new CD He is Risen performed by the Mormon Tabernacle Choir with the Orchestra at Temple Square. True to the Mormon Tabernacle Choir's reputation, the harmonies are gorgeous and bring the spirit of the song straight to the listener! Each song on this CD testifies of the Easter season. The orchestra is beautiful, the songs are gorgeous and the wonderful voices of the choir bring the spirit of Christ straight to you. I could listen to these six songs on repeat; what a beautiful blend of vocal harmony and orchestra! This is definitely one that you will listen to over and over again! You can pick up your own copy of He is Risen via Deseret Book.